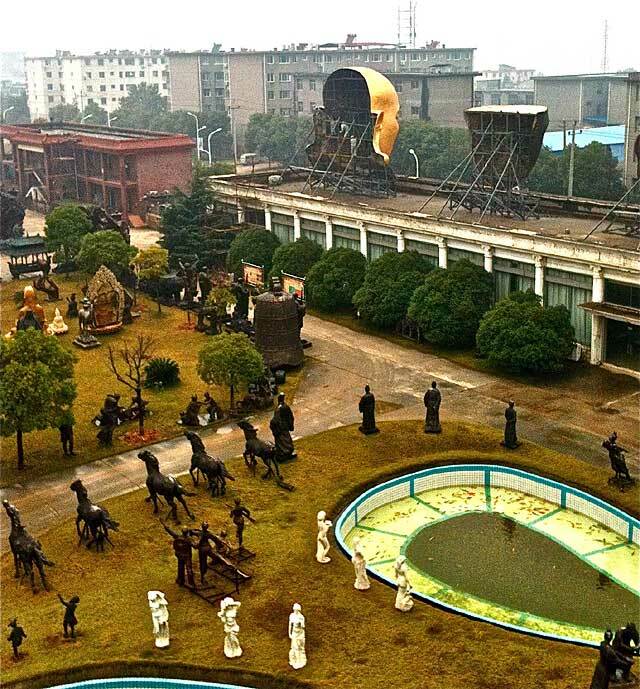 As adjunct to my participation in the Shanghai Contemporary Art Fair (AOA November 2012), I scheduled a two-day side trip to Nanchang to get a up-close view of the Jiangxi Tongqing Metal Handicrafts Company in the hopes of finding a solution to escalating casting costs in the US. 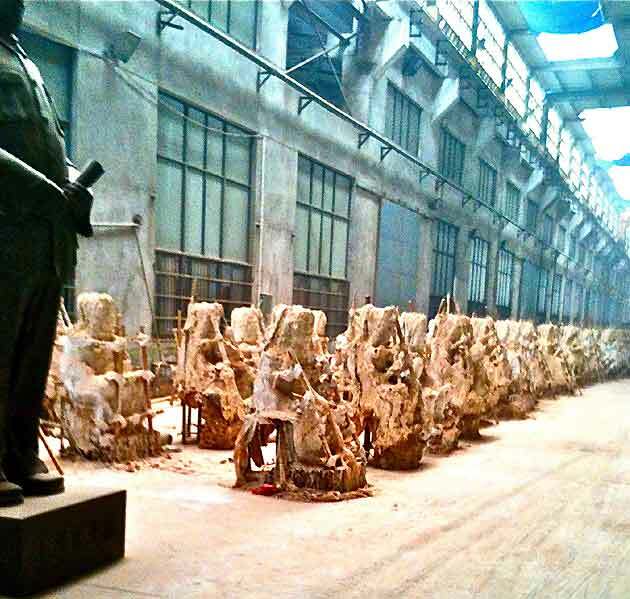 Like many sculptors, I had become frustrated seeing my market shrink as the price for small works out-paced the economic environment, and the possibility of large-scale competitive projects faltered as fabrication costs collapsed available budgets. Accompanied by Paul Cavanaugh, a Rhode Islander with years of foundry experience and representative of Jiangxi, I left Shanghai for the Nanchang ChangLeng Foreign Investment Industrial Zone, a 1.5 hour plane ride from Shanghai. A much-appreciated and necessary translator, Dr. Wei Chan, a US educated industrial engineer, joined us. Upon arrival at the newly opened Nanchang Airport, we were met by a car and driver from the foundry. The half hour ride on an under-exploited super highway traversed numerous construction projects and the sensation of seeing a region poised for explosive growth “a la China” was unavoidable. As I descended from the car, my first glimpse of Jiangxi was a super-sized industrial complex, the entrance framed by a sculptural world populated by Amazons. From the get-go, Jiangxi offers more than an eyeful. 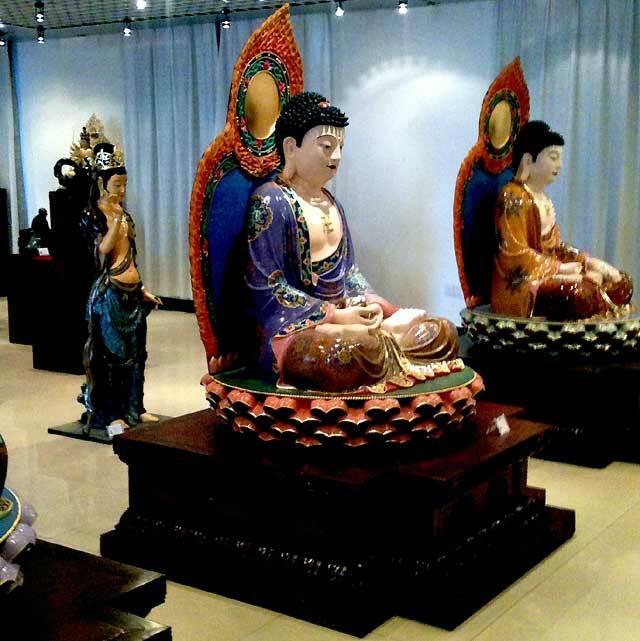 The grounds are peopled with 2-8 meter tall sculptures ranging from Seward Johnson’s “Mariachi’s” to a multiple size range of Buddha’s or paired dragons ready for pick-up to instantly adorn a temple, restaurant, garden or doorway. I was escorted to my room in the “hotel” , accommodations provided gratuitously by the foundry for visiting artists and clients; I dropped off my bags and began my official visit with a greeting from both the Foundry director and the Party representative who double-checked my passport to assure my identity. My first activity was a multi-hour walking tour of the premises that barely revealed the complexity and capacities of this foundry. The foundry consists of 450,000 square feet of workshops (some as long as two foot ball fields and 4 stories high), sprawling over 105 acres, and staffed by more than 700 employees. Suffering from a feeling of irrelevancy before such massive capabilities, I was nonetheless buoyed by their gracious treatment of me as if I were a visiting dignitary. In each work area I was introduced to the studio manager and given a thorough introduction to their activities and capabilities. Having barely caught my breath from a power-walk through their indoor gallery of 4 floors, and a quick tour of their offices, I was personally greeted by Mr. Chen ZhenBo, President and Chairman of the Board of Jiangxi. We were ushered into a dining room reminiscent of the settings from my days of diplomatic luncheons with African Ministers of State. 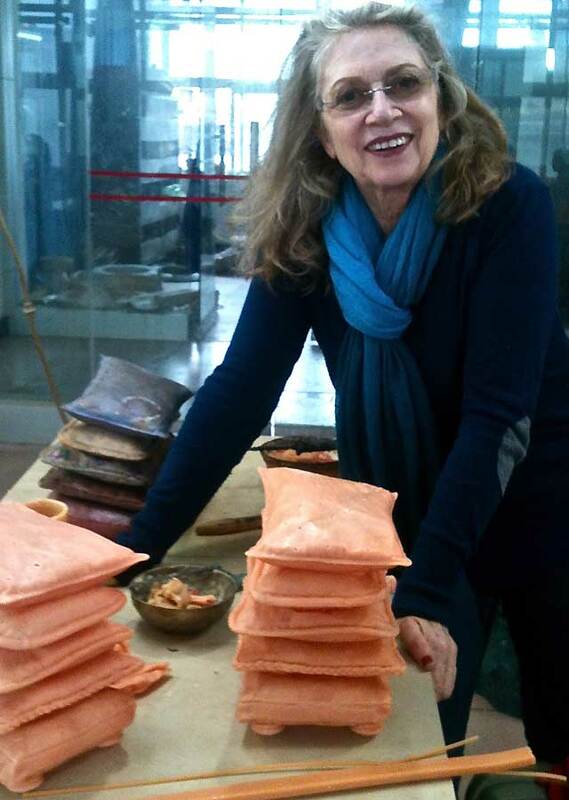 A dozen men (I was the only woman present), including 3 visiting Buddhist monks and the top managerial staff of the foundry, were seated at a round table with the prerequisite Lazy Susan on which an assortment of local dishes turned graciously for the next hour. At each place setting, a local brew that makes vodka seem like fruit punch provided the basis to toast our host and each other in a choreographed tour de role of “Campay” (“bottom’s up!”) of this firewater, punctuated by bursts of camaraderie, joking and shared cigarette lighting. This warm-hearted bonding is a necessary rite of passage for foreigners and fortunately for me, Mr Zhen Bo was kind enough to drink the first ¾ of my glass each time to assure I would remain conscious for the post-lunch program! The remainder of my afternoon was spent hiking through cavernous mold-making, casting and chasing workshops, and then through the smaller ateliers specialized in enlargements, wax molds, ceramic shell, gilding, cloisonné, box making and woodworking, (the latter in-house activities support packaging and the display of finished works). 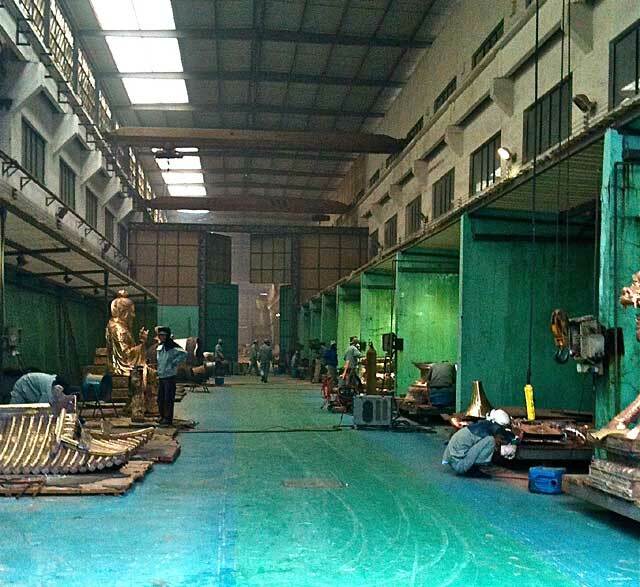 In fact, the foundry is equally skilled in small works as well as large and maintains an on-going business in cloisonné clocks, traditional figurines and Buddha’s. I was left speechless as I viewed a seemingly endless line of massive works in progress that are commonplace to this foundry. 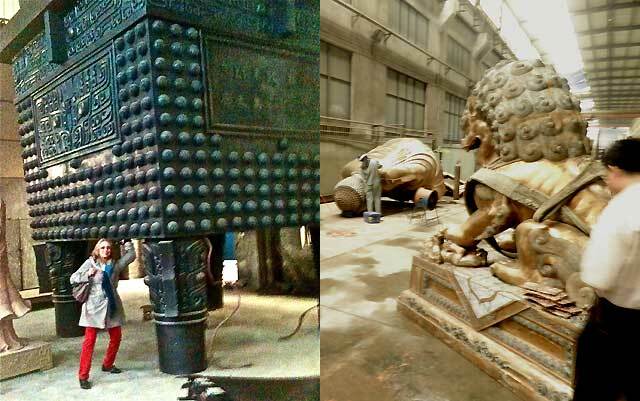 As an example: 500 larger than life-size, individually sculpted Buddha’s for a temple. I walked under the legs of an 8 ton, single-pour tripod destined for a town center, which apparently is dwarfed by a smaller version of a previously cast 50 ton, single pour, 10 meter high tripod. 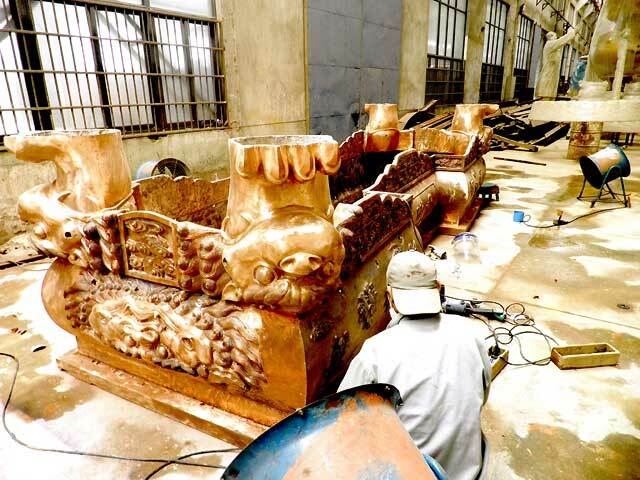 Jiangxi also holds the record for the largest ever Chinese bronze project: a war memorial in Beijing consisting of 38 cylindrical bronze sculptures each weighing 6 tons, not to mention the world’s record for the largest copper/nickel alloy bas relief measuring 39,000 square feet. Super-size me – without a doubt! The visit concluded in the late afternoon with tea in the President’s office and a very gracious explanation of the foundry’s desire to reach a larger foreign market. Presently, 30% of their $600 Million annual gross is from exports to the US, Europe and Southeast Asia. As they retool for digital enlargement capability and technology driven services, they are excited about expanding their repertoire with new, challenging work from foreign artists. During the discussions, it felt like my human – size, intimate work had become Pinocchio’s nose, growing and growing with each successive conversation. And suddenly, the “Why not me?” question was answered. This was how and where a scale of 1:10 could be executed cost effectively and expertly. Day Two I spent working side by side with a dozen lovely young ladies correcting waxes of my work that would be cast for my participation in the Hong Kong Contemporary Art Fair in May, 2013 (www.asiacontemporaryart.com). The compelling opportunity offered by the Asian marketplace had started to come together. My visit concluded with a farewell luncheon identical in form if not in guests (this time, friends of the President and a sculptor from Thailand) and then I was back to Shanghai in time for dinner. For the first time in my artistic career I find myself envisioning my works in public places, 12 feet high, brought in under budget, on time and executed effortlessly. And because I can now see this possibility, I am able to dialogue with an audience for them as well. The visit to Jiangxi has opened up a floodgate of creativity and for me, “build it, they will come” has become a reality.